Real estate matters. For most people, their house is their biggest asset. 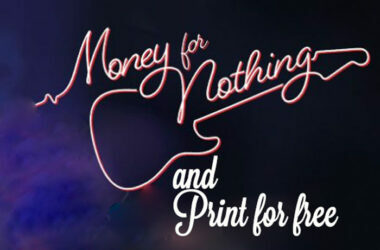 Banks usually lend more money against property than for any other reason. A lot of people’s work is directly or indirectly connected to the strength of the real estate market. There are many real estate stocks too. Therefore housing bubbles cause a lot of pain when they burst. The worrying thing is that there are some major ones around the world. The last US real estate bubble peaked in 2006. The run up was spurred on by lax lending standards, huge bank leverage and a fair bit of fraud. 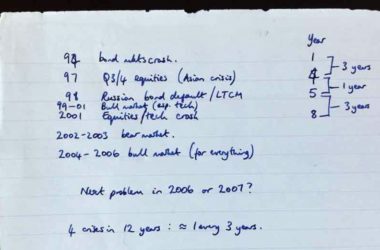 The aftermath was the global financial crisis. Obviously that was a big deal. In fact, as far as financial crises go, it was surely the biggest one ever. 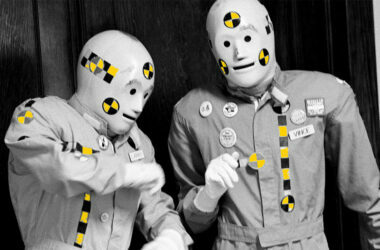 Never before had the entire financial systems of so many countries been simultaneously brought to the brink. Certainly not in peacetime. Part of the reason the crisis went global was that the US real estate bubble had company. In fact, it wasn’t even a particularly large bubble by the standards of some other countries. One of the European Union’s more stupid projects was introducing the euro. It’s the common currency now shared by 19 of the 28 (current) EU countries. 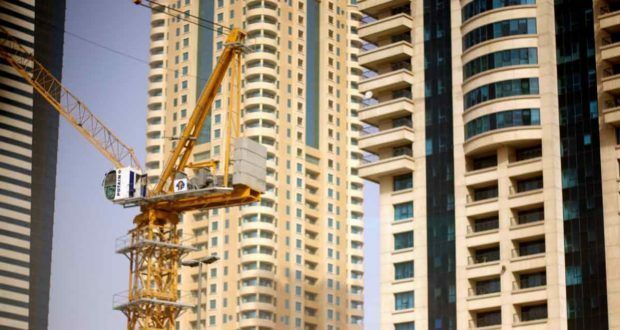 It left interest rates far too low for the conditions in certain countries, resulting in massive credit and construction booms. Three of those countries were Ireland, Spain and Greece – which went on to become members of the so-called “PIGS” (Portugal was the other one). 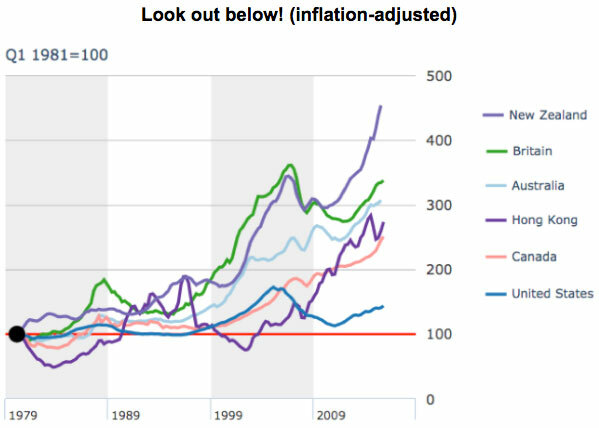 The following chart shows the relative progression of real (inflation-adjusted) house prices in those countries and the USA since the start of 1997. 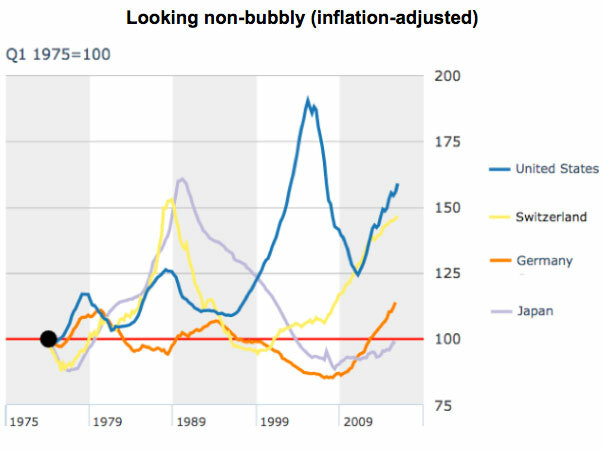 You can see that the US bubble was only a tiddler in relation to the others. 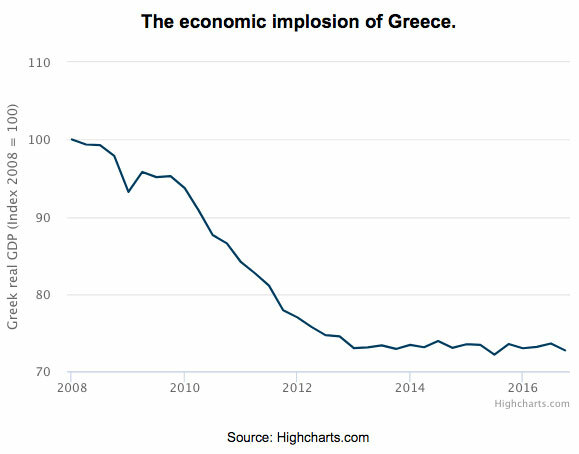 You can also see that Greece is still heading down. Which is perhaps no surprise given that its economy is still a more than a quarter smaller than its peak. Greece’s full blown, euro provoked depression continues. We’ve established a couple of things. First, there was a US housing bubble. Second, there were bigger bubbles elsewhere. Now let’s look at house price trends in a number of other places around the world. So there’s a consistent benchmark I’ll present all of them in relation to the US market. The charts I’ll show you are at the country level and sourced from The Economist. Each one starts at the earliest date where there’s data for all countries presented in that chart. They give a high level snapshot. Of course, even if a country doesn’t look bubbly there could be localised bubbles in certain cities. But a look at the country level gives us an idea of the risks. I’m focusing mainly on developed countries today. 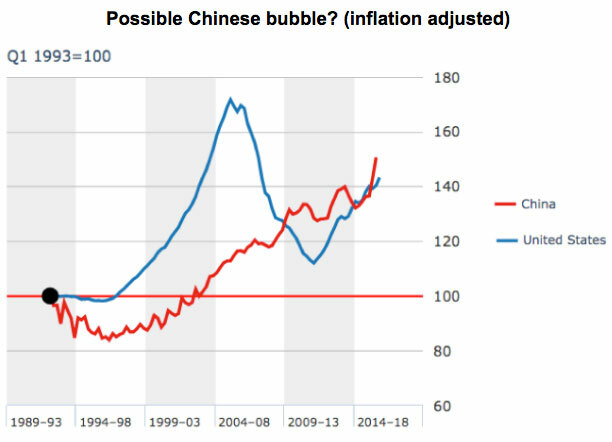 But no discussion about real estate bubbles would be complete without the inclusion of China. The following chart compares China to the US since 1993. That certainly looks like a strong run, and perhaps it’s unsustainable. But there’s something really important to remember. China’s economy has been growing like crazy, up more than four times over the past decade when measured in US dollars. At the same time Chinese incomes have risen strongly. 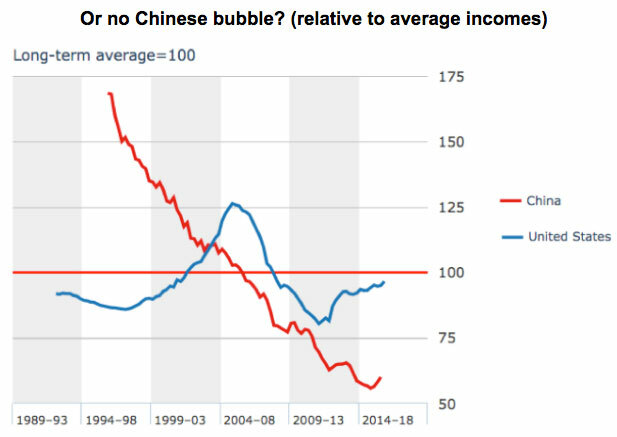 When we compare Chinese real estate prices to average incomes we get a completely different story, as shown in this next chart. Suddenly, looked at in relation to incomes, Chinese houses look cheaper than ever. I’m sure there must be issues in some places, particularly certain cities. But this data suggests it’s far from a nationwide problem. Of course this doesn’t rule out other potential issues in China, such as the explosion in corporate debt levels in recent years. With China out of the way, let’s look at some developed countries that don’t look bubbly. Here are the trends for house prices in Japan, Germany and Switzerland since 1975 – again benchmarked against the USA. Japanese real estate famously peaked out in 1991. It then fell for 18 years until 2009 and, adjusted for inflation, is still below the level in 1975! Germany previously dodged the housing bubble bullets. Rent controls played their part. Prices have shot up in recent years, presumably spurred on by ultra cheap mortgages, and perhaps by the huge numbers of immigrants from the Middle East. Switzerland has also had ultra low interest rates, and a big run up in property prices. The last time it happened was the late 1980s. That was followed by a big crash and some major asset write downs at the Swiss banks as mortgages turned sour. In any case, prices look similarly high to that previous episode in the above chart. But note they are 25% lower when compared with average incomes then and now. Where are today’s property bubbles? 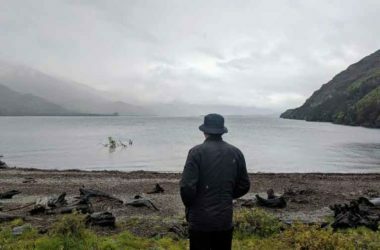 At least some of them can be found in the following places: Australia, Britain (UK), Canada, Hong Kong and New Zealand. Even a quick glance at the next chart, going back to 1981 this time, shows there is major cause for concern in those countries. The US had a proper correction. 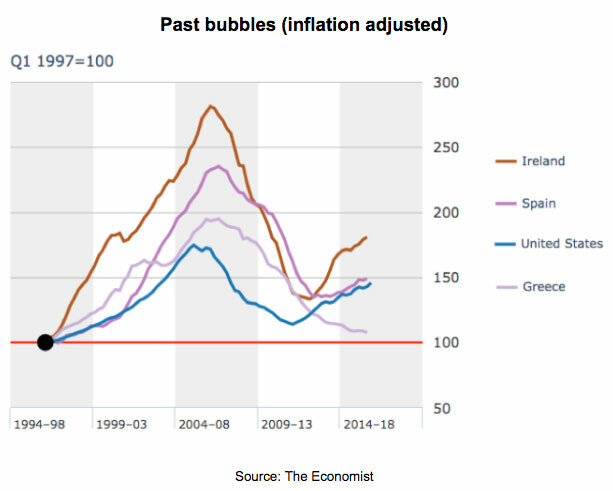 Britain had a pause following a much bigger bubble. But since then it’s closed back in on the earlier peak of 2007. As for the rest, they’ve barely paused in their march ever upwards. Australia, Hong Kong and Canada all look positively buoyant, to say the least. New Zealand looks insane. The line is practically vertical at the end. Investors in stocks need to know about real estate bubbles. That’s because the consequences can be extremely harsh when they eventually burst. Banks take big write downs, credit dries up, homeowners stop spending, construction workers and real estate agents get fired, furniture businesses go bust. For example, this is one of the reasons that I’m cautious about stocks in Hong Kong. Money has flooded out of mainland China in the past decade as its economy has quadrupled in size. This was very noticeable last time I visited a few years ago, as compared with when I lived there between 2002 and 2005. At the same time, the Hong Kong dollar is pegged to the US dollar. This means interest rates have been insanely low for Hong Kong’s reasonably strong economy. In turn mortgages have been dirt cheap. These factors have driven the housing market to ever higher levels. More recently the stock market has taken off too. You can see that in this five year chart of the iShares MSCI Hong Kong Index Fund (NYSE:EWH). The specific issue with the MSCI Hong Kong index is that 59% of the value is financials (mainly banks) or real estate companies. When the housing bubble eventually pops – which it surely will one day – the effect on the stock market could be catastrophic. What if we adjust for changes in average incomes over time? Does that make things look better. Actually no, as my last chart shows. Actually, on this last measure, US house prices still look relatively cheap. Of course the US is a vast place, and local markets vary widely. But in aggregate, at the national level and taking a long term perspective, US houses appear reasonably priced. But all the other country markets look just as extreme as before. Property bubbles usually cause all sorts of economic and financial mess when they burst. So it always pays for investors in stocks to keep an eye on them. When they burst the result is usually a general recession, and of course real estate and banking stocks get slammed directly, as house prices collapse and mortgages or other loans turn sour. 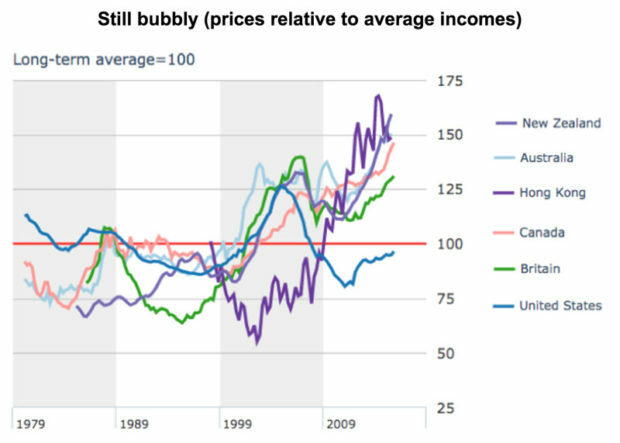 Australia, Britain, Canada, Hong Kong or New Zealand all show clear signs of real estate bubbles. Any investors with exposure to those countries should be cautious. Eventually these bubbles will burst. PS Do you live in one of the countries mentioned above? Or another place where house prices are in a bubble? If you do then I’d love to hear your personal view on what’s going on where you are.